Tile and grout floors and surfaces are durable and relatively easy to keep clean. When sweeping and mopping don't suffice, some people resort to more drastic cleaning methods that can cause an unsightly appearance or even permanent damage to the tile and grout. Here are the most common cleaning mistakes. The first and most common mistake is wet mopping rather than damp mopping. Dirty mop water seeps into the porous surface of grout and unglazed tiles. 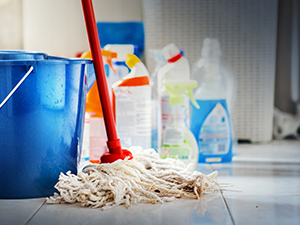 Damp mopping and frequently changing the mop water is the method of cleaning we recommended. Beware of colored cleaners. They can stain unglazed tile, because the surface of the tile is porous and may absorb dye from the cleaning agent. Muriatic acid, bleach, and other harsh chemicals should not be used for routine cleaning and care of your tile and grout floors and surfaces for several reasons. First, harsh chemicals can be dangerous. Any mishandling or misuse of these chemicals can result in severe burns or respiratory problems. Secondly, splashes or spills can damage plumbing fixtures, appliances, or other belongings in the surrounding area. In some cases, even when no splashing occurs, the vaporous fumes can cause damage. Thirdly, strong cleaners can cause premature deterioration of grout, especially if the grout is alkaline and the chemical is acidic. Never use steel wool or metal scouring pads to clean your tile, because these can cause permanent scratches, stains, and ruin a glossy finish. Abrasive powders and abrasive tools should be avoided, as well. Waxes and wax-based cleaning products may offer some temporary protection against stains, odors, and wear, but for a long-term solution, waxes pose too many problems and may actually increase maintenance costs. They must be continuously stripped and reapplied. If the stripping process isn't thorough enough, wax build-up occurs and becomes an unsightly mess as it turns yellow, becomes scratched, and functions as a dirt magnet. Oil-based cleaners, especially on glazed tile, pose an increased risk of slip and fall accidents. Sealers can be tricky, and unless you have the knowledge and experience of a tile and grout cleaning professional to select the proper sealer and apply it appropriately, you could end up with slippery tile, stains, or peeling and flaking grout lines. If you are trying to resolve some specific problem with the appearance of your tile and grout, avoid the mistakes mentioned here. Download our FREE Stone and Tile Care Guide for tips and helpful information about routine cleaning and care of your tile and grout floors and surfaces. Feel free to contact us for specific recommendations.